Cakewalk synthesizers are some of the most powerful and widely used synthesizers. 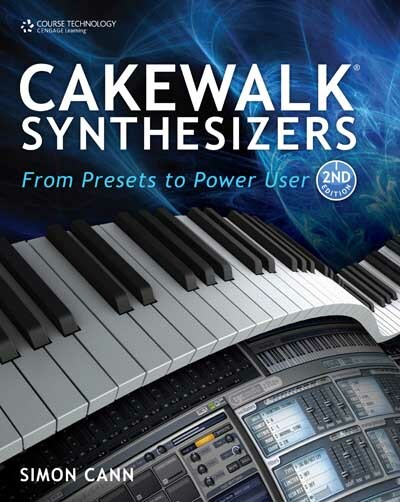 Now in its second edition, Cakewalk Synthesizers: From Presets to Power is the comprehensive resource to help users harness the power of these amazing tools and show you how to get the best results from Cakewalk’s complete range of synthesizers. The book begins by diving into the general principles of synthesis and sound creation—covering, among other topics, oscillators, different synthesis methods, filters, envelopes, LFOs, and effects—and then moves on to look at how to make your own sounds which can be used in your own productions. Separate chapters then focus on each synthesizer, looking at its range of uses, the tools that are available, and how to set it up for day-to-day use. These chapters cover: Triangle II, PSYN II, Pentagon I, Z3TA+, Session Drummer 2 and Session Drummer 3, Dimension LE and Dimension Pro, Rapture LE and Rapture, and Beatscape. In the (free) accompanying download package the chapters cover: sfz and sfz+, Cyclone, RXP, DropZone, Square I, DreamStation, Roland GrooveSynth, and TTS-1. In addition, there is a revised and expanded section in the book dedicated to the SFZ format, Cakewalk’s powerful sample format (which has also been adopted by other leading synthesizer developers) and undocumented features in the synthesizers are also highlighted. Since the publication of Cakewalk Synthesizers: From Presets to Power User, second edition, Z3TA+ has undergone a major upgrade becoming Z3TA+2. Follow this link to download the free update covering the changes introduced by Z3TA+2 (version 2.1). There is a package of downloadable material for this book. This includes additional chapters and is available for free to everyone (you don’t need to have bought the book). This package also includes sound design master classes from several leading synthesizer programmers and so is well worth checking out. Click here to get hold of the download package. The book mentions the SFZ Tools which are a group of tools that make it easier for musicians to create and edit SFZ definition files and to see what’s going on while they are doing this. You can read more about the tools and download a copy (they’re free) by following this link. Cakewalk Synthesizers: From Presets to Power, second edition, is available from leading book retailers including Amazon.